For the more traditional bedroom, spruce up your décor with a pop of color in the Juliana Comforter Set. Made from polyester quilted charmeuse, this decorative collection features chocolate brown, light blue and ivory accents. Includes three decorative pillows which play up embroidered details for a finished look. Two euro shams give a dramatic backdrop to this striking collection. I just received this set. I ordered it for the master bedroom. The color is very true to the photo in my opinion. My room is painted SW6108 Latte, which is a neutral brownish tan, and it looks really nice and classy with this set. The exact color match for the comforter blue would be SW 6220 Interesting Aqua. Not a sea foam, but blue with just a pinch of green/grey in it, The value for the price is really good as you get 3 pillows and a bed skirt! It is ultra soft on both sides. The outside of it is kind of like the back side of satin..not shiny, but matte. I hope my dog's claws don't ruin this pretty thing. There is a ton of pretty stitching all over it. The backside feels like microfiber, and seems durable. The comforter has more loft than a quilt, but much less than a comforter, so it's a great weight for any season and should easily fit in the washer, even a king if you have a large front load washer. I'm very happy with the quality, but am a bit nervous about the dog thing being my dog is 55 lbs, and there is a lot of decorative stitching. I am keeping it and am very satisfied. The colors are really modern. The pillows are cute. You will need to purchase "pillow inserts" for the 4 shams. Two 26X26 and Two Standard (21X27). I have had this comforter set for about six weeks and one washing. 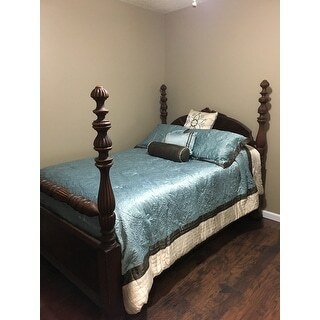 The colors as pictured are very close and look great in our bedroom with its light blue walls, brown and cream curtains, and brown headboard. The circular quilting pattern with a slight sheen on the polyester fabric gives this comforter a classy look. The three decorator pillows: one in the same blue polyester, one in cream with stitching, and one in brown tie all the colors together on the border of the comforter as well as the bedroom colors. While having nine pillows on your bed is may be overkill for your spouse, they surely give a striking appearance. I can change the look by alternating the brown European shams with the regular blue pillow shams. The comforter did wash up like new. If you have pets on your bed, I do not recommend this comforter since the quilted stitching can be easily snagged. The comforter set did arrive in a timely fashion; no problems in shipping. All in all, I could not be more pleased with this comforter. This is a beautiful comforter set. I will need to buy pillows for the brown shams that are 24" x 24" but it's a small price to pay to add to the beauty! Love it! I was happy with the color of this comforter, but the construction wasn't as nice as I had hoped. 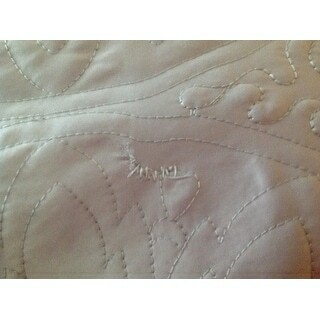 There was some stitching that had already started to come loose on both the shams and the comforter. The length was fine, but there could have been a few more inches on the width for more coverage. We have a mattress that is higher than normal so the extra width would have been great to have. I received my order today and opened the box immediately, the color and fabric are better in person than in the picture. The blue it a soft natural blue with not hint of green or aqua and that's exactly what I needed in my master bedroom. The fabric and quality of the set is perfect. I am totally satisfied with the set and can hardly wait for my new bed to arrive. There was a few loose threads and I removed them with scissors and there are no gaps in the stitching. I think by not pulling the loose threads and trimming with scissors is the key to not damaging the comforter. I have purchased several times from Overstock.com before...ie...comforter set, fabric shower curtians and now this bedding set. I am not surprised at the quality and ease of purchase. It was delivered 3 days earlier than expected so I'm very pleased. Happy shopping!! One of the problems with most comforters is that they are not wide enough or long enough. This one is perfect in every way. I love the colors! Yes, there are a few strangling strings, but not a big deal. My bed looks so comforting and my room looks so elegant. Having recently moved in together, I knew my boyfriend would not share my love for pink so I took a cue from his brown and blue bathroom and found this comforter set. He approved and we are very pleased. The blue is feminine for me and the brown appeals to him. The quilted top lays nicely on our queen bed and although it doesn't hang down the sides as long as I'd like, had I ordered a king the bed skirt would have been too big. I would also give up the Euro shams or a throw pillow in exchange for a sheet set. That reason being my 4 stars instead of 5. Overall I'm happy with the colors, the quality and the price. When my boyfriend was unhappy with a previous comforter set that was stylish, but not comfortable - I had to pick something else. We chose this one for the style, the colors and how much stuff one gets with this set. I was nervous about the comfort, but we needed something and based on the other reviews from users, I felt it was a safe bet. It was! The color was really soft and elegant. What I was most pleased with was how soft the fabric was. My boyfriends main complaint about the previous comforter set I had picked, this blue set was a relief! We can lay on top of our beautiful bed and feel comfortable without losing the style. I also didn't even have to wash it, we got home late and I wanted to just go to bed - so we pulled everything out of the zip plastic and put it on - no weird smell, it was clean, soft, warm and pretty. My only complaint about this set was that the cardboard box it came in was damaged a bit and the fabric on some of the pillows and comofter had frayed a few strings loose that I had to cut off. Its a great set and I'm happy with the choice, as is my boyfriend! The colors are vivid and the comforter is soft and luxurious. I love this set! It's gorgeous and the quality is superb. I can't believe it was as cheap as it was because it feels and looks like something that would cost hundreds of dollars. This is a great comforter set! I am loving my new comforter set. Shopped around for a while and finally decided on this one. So glad I did. The colors are perfect and the comforter is warm at night. Great set for a great price. It looks good in the bedroom, but found a corner tear in the pillow sham, which I repaired myself (see photo). Had to iron the whole set because it was a wrinkled mess and did not realize that the brown euro pillow sham did not come with a pillow filler. But, for the price I paid, it's not a bad value! It wa bound to happen. After years of ordering a wide range of items from overstock this is my first negative review. The material for the comforter and accessories is cheap looking and feeling. The colors and actual fabric don't really match the soft rich looking comforter from the pictures. It's too much of a hassle to return such a large item. We will just keep it in hand for the occasional unexpected overnight guest. Color not exactly the Blue as shown, more Aqua. As stated above, the Blue color as shown, it look more like Aqua. however I still like the color, I wasn't too impressed with the wrinkle in the dust ruffle or pillow shams as I had to press them out, but over all quality is Good. Absolutely beautiful. Just what I expected. I was hesitant at first because of the previous reviews about the color. It is not a true blue. Its more of dull muted blue. The fabric is somewhat shiny but does not shift. I have this on an antique 4 poster full size bed. The queen size comes fully over both sides to just past the middle of the bed rail completely covering the box springs. There is also ample room at the foot of the bed providing full coverage. I had no need for the bed skirt. Very happy with this. Have not put it on the bed. cleaning walls and carpet now. This is a very classy looking comforter set. Except for the satin European pillow cases & the dust ruffle. The satin fabric is too flimsy. But, the comforter & decorative pillow cases are really nice. The stitching designs are very pretty. Product was what i wanted to bad it was shipped to an old address. I don't care for the fabric and there were a lot of threads that I had to cut off. I bought this comforter set to change my bedroom from my spring/summer bedding to a fall/winter look. I love that the comforter is oversized and nicely covers our bed. We have a panel bed with drawers on each side and the comforter drops down at just the right length on each side to fully cover the bed while still allowing access to the drawers. The pillow cases and shams are also very nice. The pattern of the entire set is lovely. Very good quality fabric. Nice accent pillows also. My husband loves it and was excited to make the change. Very good buy. "Do the sheets and pillow cases come with it??" "Does this comforter fit on all sides a pillow top bed?" The queen size is approximately 92 inches x 96 inches. The king size is approximately 110 inches x 96 inches. It does. My mattress is pillow topped on both sides, and there is enough drop to cover to the mattress. "Is the top of this comforter soft or more of a satiny feel?" It has a satiny feel. While the comforter has a sheen to it, the top of the comforter doesn't feel really soft or smooth; the stitching gives it a textured feeling and more decorative look. Pets nails or fingernails can snag on the stitching also. I love the comforter but some extra care should be used. "Is this a seaform green/blue or a blue/blue??" Hello spooky727, we try to represent the colors of our products accurately. Unfortunately, due to the difference in monitor colors we cannot guarantee that the color will match exactly what you see on your screen. In my opinion seafoam does have hints of green. Thank you for shopping with Overstock! Spooky - the blue does lean a bit toward aqua. I wouldn't say seafoam though - to me seafoam is much more green. I would say a blue/blue.. Love it and have had many compliments! "The "as is" is $70 and the not "as is" is $114. What does "as is" mean?" Hello ginge1r, the "as is" item may have been previously used or opened and could have blemishes, scratches, dings or dents. It may not arrive in the original manufacturer's packaging or include all original accessories. This item has not been reconditioned, but was inspected for basic functionality. Manufacturer's warranties are void. This item is sold 'as is' and cannot be returned. Thanks for shopping with us! "Does the bedskirt have split corners ?" Hello AZNANA, no, it does not. Thank you for shopping with us! "does the beige edging on the comforter follow along on all 4 sides?" Hello holymac, this item features the beige edging on three sides. Thank you for shopping with us.